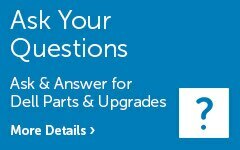 It's simple to find Dell branded spare parts & upgrades that are validated compatible and quality tested to work with your Dell system. Choose either Dell System Analyzer to provide your current configuration - or - enter your Dell service tag. Sorry, System Analyzer is currently supported only for Internet Explorer. Please enter your Dell Service Tag under Option 2 or select your system under Option 4. Search for parts & upgrades for your Dell with your unique Service Tag at the bottom or back of your system.